I’m an Idaho, USA artist who started out painting flat canvases. When I began some years ago adding small projecting effects, I realized just how much fun it would be to get really seriously three-dimensional. I now construct contemporary sculptural assemblages from discarded objects and recycled materials, primarily wood, but sometimes I add metal and glass for accent. The visual and tactile appeal of these pieces derives from strong geometric design, tantalizing textures, and vibrant acrylic colors. Most of the works are wall hung, but some are free standing. They vary considerably in size and color palette. Occasionally I incorporate archetypal symbolism and playful whimsy, and I have ventured into stylized native American figures, but more typically the pieces are nonrepresentational, “art for art’s sake,” i.e. purely for aesthetic enjoyment. The work is for the most part highly detailed and labor intensive. My approach is serendipitous. I try to discover the forms that are inherently unifiable in my miscellaneous stash of reclaimed materials. Intuition plays a big part in my process. 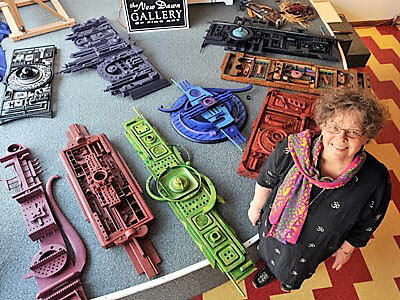 Though I have never considered her an influence, my work has been frequently compared with that of Louise Nevelson. Inquiries are welcome. I will reply to you promptly.